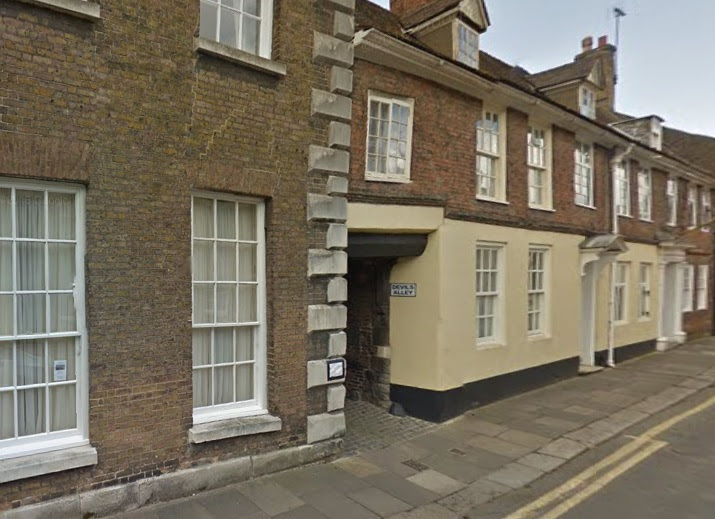 A short walk that includes a town trail to view the historic centre of Kings Lynn. There is plenty of history here and the descriptions in this account scratch the surface of what has occurred through the ages. The feature that we concentrate upon in this instance is the legend that surrounds the burning of the witch Margaret Reed in the 16th century. Five star family run site at Fleet Hargate just off the main A17 and a perfect location for walking the Wash footpaths. Peaceful and secluded site with easy access to local pub, village shop and a Chinese restaurant. This walk could have been included in the section from Sutton Bridge with a simple extension across the River Ouse. However it was felt that Kings Lynn deemed the need for a little more time to explore, therefore with the short walk from West Lynn to the first bridge across the Great Ouse, this provided a riverside walk and a wander around one of the advertised town trails. The views of the river are magnificent, a wide open landscape of the mighty Great Ouse that flows out into the expanses of the Wash. On the Kings Lynn side of the river a paved path makes for some easy walking although beware of passing cyclists. From this point onwards there is plenty to see. Part way along the path one encounters a tall wooden sculpture of a hooded figure standing aloft on some kind of stilts with arms raised, carrying something that can not quite be determined. A half barrel? A very small boat? It is totally unclear and there are no signs or notices to provide an explanation. This is the entrance to Hardings Pits, one of the largest Doorstep Greens in the country, an open space for recreation and wildlife conservation. The area features many timber based sculptures created by the late Ben Platts-Mills, the centre piece being a 20 feet tall Great Whale. It is uncertain what this particular work of art is supposed to represent but no doubt it is highlighting something to do with the areas fishing industry rather than an acclamation of a not so famous local stilt walker! The path continues around the outfall of the River Nar where, on the road beside the path, are the ruins of the what is known as the Carmelite Arch or Whitefriars Gate. This two storey archway with plaintile roof was the gatehouse to the Whitefriars Friary that once stood on the site. A plaque on the ageing brickwork states. A brief search reveals that Margery Kempe was a Christian mystic and her book detailed her pilgrimages to Santiago de Compostela and the Holy Land as well as her domestic life and her mystical conversations with God. The British Library has digitized the only known copy of this book. A transcribed version is available online from University of Rochester. The path now leads onto the Quay which has been revitalised into a tourist oriented area with restaurants and coffee houses. Ancient cobbled roads lead away from the quay. It is undoubtedly a calm and tranquil place and somewhere worthy of taking a rest with a cup of coffee and watch the world go by and the tide ebb and flow. There is a pedestrianised roadway that leads through this area and unfortunately there are many folk who appear to have not understood what legs are for and consider that the only way to view the quay is to motor past, gawping in all directions apart from the way ahead. From the quay, one can take the cobbled College Lane to view both the Town Hall and Lynn Minster. An interesting feature that immediately draws ones eye on the right hand tower of the minster is the Tide Clock or Moon Clock. This ingenious device, with just a single hand and the lettering 'L Y N N H I G H T I DE' in place of the numerals, is a 20th century reproduction of the original device which was installed in the 1680s. The clocks hand makes a full rotation every lunar month which provides an indication of the time of high tide. As one enters the Minster there are markers on the stonework depicting the heights of various floods that have deluged the minster. The start with 20th March 1961 and with increasing height they commemorate the floods of 1st March 1949, 11th March 1883, 31st January 1953 with the highest set for 11th January 1978. A timely reminder that one is never too far away in time from a flood in these parts. Leading south from the minster is Nelson Street and wandering down here, on the right hand side one can find a cobbled alleyway between the houses that has a sign marked Devil's Alley . The name references a legend of a ship that docked at the port which harboured none other than the devil himself. A priest was summoned to rid the town of this evil and confronted the devil at this very alley, driving him back to the ship by means of holy water and prayer. During the confrontation the devil stamped his foot, some say hoof, so hard that an imprint was left on the cobbled ground. Sadly such an impression is difficult to determine in modern day. Returning to the minster, then heading along Queen Street, on the right one passes Clifton House, a merchants house that dates from the 13th century and is open to the public. Then at the end of the road one reaches Purfleet Quay with the iconic old Customs House at its head. This now the location of the Tourist Information Centre and provides a place to pick up a town trail leaflet. Continuing along the road to the far end of Market Square is Ferry Street where The Pilot's Office and tower are located as well as the Anchor Street Brewery with the attached Crown and Mitre pub which dates from 1743. Returning around to the Market Square we now continue to St Nicholas Street where there is another Arch, this time the entrance to Bennets Yard and dates from the 15th century. At the end of the road is St Nicholas Church which is worth visiting in order to see the grave of Robinson Crusoe which is located at the west end by the 17th century font. In fact there are ledger slabs dedicated to many members of the Crusoe family with two named Robinson. These date from after Daniel Defoes 1719 book of the same name so the presumptions that this inspired him to name the character cannot be true. However the fact that Defoe did visit Lynn on numerous occasions does beg the question of whether he knew the family. Navigating through the town and via the train station one comes to an area known as The Walks. This green park area is the only surviving example of an 18th century town walk in Norfolk and includes the 15th century Red Mount Chapel or Chapel of Our Lady of the Mount, which was a stopping point for pilgrims on their way to the Shrine of Our Lady at Walsingham. Finally we return to the quay by way of the ruins of Greyfriars Tower, the only remaining part of a Franciscan monastery that once stood on this area. Although the rest of the buildings were demolished the tower remained as a landmark for sailors. Up until 2006, when correction work was carried out, the tower leaned to the west by one degree and was popularly known as the Leaning tower of Lynn. All in all, Kings Lynn has a lot to offer in its historic legends, tales and accounts and one could probably spend a lot more time exploring this ancient town. However there were some distinctly dodgy looking individuals in The Walks who certainly appeared to be up to no good and it didn't seem the place to hang around without enticing unwarranted trouble. Maybe we should have summoned the local priest to challenge these reprobates with holy water and prayers and send them packing on the first ship out of town. Alight at the bus stop on Clenchwarton Road in West Lynn. From this point one can either wander into West Lynn and pick up the riverside path at the Ferry or walk along Clenchwarton Road to the river bridge. Cross the bridge and take the riverside path/cycle track towards Kings Lynn. Keep to this path, following signs around the outfall of the River Nar until the South Quay is reached. Take the cobbled College Street up to Lynn Minster, turn left and follow Queen Street through to Purfleet Quay. Continue straight ahead into Kings Street and on into Tuesday Market Square. At the far end follow the road around to the right and into St Nicholas Street with the church at the end. Walk through the church grounds and out onto Pilot Street beyond. turn right and follow this little lane back through to Chapel Street. Turn left and follow Chapel Street to the pedestrianised Norfolk Street. Turn left and continue to the junction with Railway Road. Turn right and follow this for 230 yards. On the right is a road named Waterloo Street, take this up to the railway station. Turn right and where the road bends sharp right go straight ahead on the path into the park. This is the walks. Follow the path through to Red Mount Chapel and then beyond to the old town wall. turn right and follow the path to the park entrance. Cross the busy main road and walk through the Greyfriars gardens and through the tower and out onto St James Street. Continue straight ahead back to the minster and the South Quay. To return one can either get the ferry back across the river or by bus from the bus station by taking the first right along St James Street and following the lanes through to the shopping centre. On the left Sculpture on riverside path ; On the right remains of Whitefriars Friary, the Whitefriars Gate also called the Carmelite Gate. An historic 15th century town house that was originally used by the Clerks of the Chapel of St Nicholas. It became a public house in 1714, taking on the name of The Lattice House and later becoming Ye Olde Lattice Inn up until its closure in 1919. A lengthy period of closure ensued until it finally reopened as a pub in 1982 under its original moniker. It was part of the Wetherspoon pub group from 1988 until May 2016 when Hawthorn Leisure acquired the premises. There are plenty of pubs to choose from in Kings Lynn, so why the Lattice House? The principle reason was that it oozes character. At the time of our visit is was part of the Wetherspoon chain so there was a good selection of ale, but the interior was as grand as the exterior which entices one in just to see what is inside. The only disappointment was that it appeared to have a few resident drinkers whose sole occupation in life was drinking and being able to put anyone right on any subject under the sun. Whatever the discourse of conversation, they knew better because they had probably read it in their beer sediment. Kings Lynn, like most towns in East Anglia, had its fair share of witch trials during the middle ages. Innocent women were accused of being witches from the vaguest of associations and the flimsiest of evidence. The accused would then be put on trial to determine whether they were indeed a witch. A common method was the ducking stool where the accused was tied hand and foot and lowered into a river or pond. If they floated, this would be evidence that the water was rejecting her and hence she was determined to be a witch. If she sank and drowned she was deemed innocent. A second method was known as pricking, where insensitive areas of the skin were pricked with a pin or needle. If they felt no pain, did not flinch or did not draw blood, it too was evidence of their being a witch. In truth it was pretty near impossible to prove ones innocence once accused of witchcraft. The common method of execution was hanging although there are instances where burning at the stake was performed. It is unclear what determined the method of execution and was probably down to the judges discretion or, as some sources note, the burning was to cleanse the soul and was done as a mark of pity on the accused's afterlife. The legend that is the subject of this feature concerns the fate of one such accused witch who was burnt at the stake in Kings Lynn. In some iterations of the story it is Mary Smith, in others it is Margaret Reed (sometimes spelt Read). There is plenty of recorded evidence that Mary Smith was hanged in 1616 whereas similar records confirm Margaret being burnt 26 years before. Therefore the tales that use the former name are clearly incorrect and we shall continue with the legend under the name of Margaret Reed. Little is known of Margaret's life or why she was accused of being a witch. The various modern accounts found in books and on websites have a variety of explanations including that of murdering her husband by way of witchcraft. Another common theme that is often described, an example being on the website for Kings Lynns Vancouver Shopping Centre, tells a tale of a neighbours wife falling ill with a fever and then dying which the neighbour attributed to a curse put on her by the witch. This specific instance of the legend uses the name of Mary Smith but contains no citation as to where the information was taken from. The fact that it uses the incorrect name and the incorrect year for the execution would indicate that it may just be hearsay and guesswork or reiteration from word of mouth. This particular detail is common in other instances of the legend and we may surmise that the information has been taken from a 1620 publication titled A Treatise of Witchcraft which details Mary Smiths accusation and trail. Indeed, this may be the source of many instances of the legends details, where the story tellers have picked the best bits from this book to augment the scant records of Margaret Reed's accusation, trial and execution. What we do know is that Margaret was burnt in the Market Place in Kings Lynn for this was the common location for public executions. Some accounts state that she spent her last night at the Griffin Tavern. There was indeed a hostelry on the Market Square that occupied the location of the present day Dukes Head Hotel and was recorded as the Gryffren in 1526, the Griffin in 1646 and then demolished in 1683. The many accounts of her execution are probably richly embellished to provide a more gruesome story and thus far I have found no documented details of the actual execution. From various descriptions of such executions we could probably guess that the accused would probably have stood in an empty tar barrel, maybe her body smothered with tar, and tied to the stake. Faggots would be heaped round her and then the pyre set alight. In some accounts, the accused would be strangled prior to being burnt although heretics were more likely to have been allowed to burn alive resulting in a slow and horrible death. There is no clear indication as to whether Margaret was hanged prior to burning or was allowed to be burned alive. Some accounts of the legend imply that she was burned alive although this may well be an embellished account rather than from a factual source. Some documentation even assumes the suspect to be burned alive when there is no record of such a fact. The legend of what happened during the burning is in general agreement throughout all accounts. 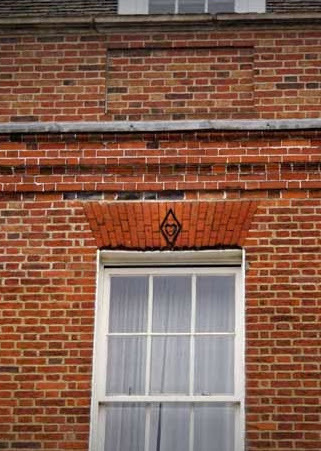 It is stated that as the flames consumed her body, Margaret's heart burst forth from her rib cage with such power that it hit the wall of the building opposite, searing a mark into the brickwork that left evidence that can still be seen today. It is true that a mark does exist. 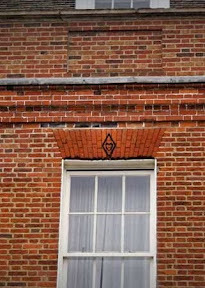 If one walks to the north end of the Market Square, on the unpainted brick building, above the window directly over the main door, a diamond shape encompassing a heart set into the brickwork is clearly visible. This has obviously been carved to highlight the bloodstained mark and is the source of the legends persistence through the centuries. This mark is locally known as the Diamond, or Witches Heart. What happened after this gruesome event, once more diverges depending upon the account one reads. The most embellished accounts state that the heart bounced back from the wall, then managed to bounce down the lanes to the river where it disappeared beneath the water, some saying in a mass of sulphurous waves. This must have been quite a feat for a dying heart, for the River Ouse is 200 yards from the site of execution as the crow flies, and considerably more if one has to navigate down the lanes. One can imagine the crowds ducking and moving out of the way as the flying heart cleared the closest bystanders, then, upon landing on the ground, scampered away through the crowds like a scurrying rat! This clearly is exaggeration. The legend doesn't end here for it continues with the heart being found some time later, some accounts say on the banks of the River Ouse whilst others put it on the banks of the Gaywood River which flows through The Walks and outfalls into the River Ouse south of the quay. The more gory accounts have the heart still beating as it was taken to the town leaders who then interred it with her ashes in an urn and buried it out of town. The urn is said to have laid at this undisclosed location until it was discovered by workers in the 21st century. I can find no record of such a discovery and this part of the story may be taken from a work of fiction. In the Spookshow series of books by author Tim McGregor, in the fifth of the series titled 'Half-Boys and Gypsy' he writes about a tomb discovered in Norfolk by construction workers excavating a car-park and inside the tomb were the remains of the witch Margaret Read. This, although the author has loosely based the story around fact, is totally fictitious with no evidence of the event having occurred. Nonetheless the legend persists, its details reiterated time and again in the books of the ghostly fables of Norfolk, and with each recording, the reader is treated to a more colourful story. In truth, all that may have happened is during the burning of a witch in the 16th century, due to the pressure of gases built up within the body by the fire, a small explosion resulted exuding internal organs. The rest is probably just imagination and enrichment.